The mostly agricultural area consists of three counties that extend down from the southeast corner of Missouri and is surrounded by Arkansas, Tennessee, and Kentucky. The co-op brought electric service to homes in the region in the 1930s and Jack and his colleagues are performing a similar service today by bringing broadband to a region where large corporate ISPs haven't invested much in infrastructure. In this interview, he describes what Internet access is like for people in the region before the cooperative decided on the project, and how strong support from residents and businesses has helped the cooperative determine the services to offer. Rural electric co-ops have started delivering high quality Internet access to their member-owners and our guest this week on Community Broadband Bits episode 229 is dedicated to helping these co-ops to build fiber-optic networks throughout their territories. Jon Chambers is a partner at Conexon and was previously the head of the FCC's Office of Strategic Planning and Policy Analysis. Jon is a strong proponent for ensuring rural residents and businesses have at least the same quality Internet access as urban areas. We talk about his experience and frustration at the FCC, which was content to shovel money at telcos for the most basic infrastructure rather than setting higher expectations to ensure everyone had decent Internet access. We talk about how Co-Mo rolled out fiber to its members without federal assistance, inspiring electric cooperatives around the nation to follow suit. In our discussion, I reference Jon's blog post "FCC to Rural America: Drop Dead." In it, he cites some of the reactions in the FCC from his advocacy for real rural solutions rather than signing big checks to big telcos for delivering slow and unreliable Internet access. One of quotes from a Democrat: "Republicans like corporate welfare, so we’re going to give money to the telephone companies to keep the Republicans on the Hill happy." Neither political party comes off looking very good when it comes to rural connectivity, which fits with our impression. But Jon confirms another of our experiences when he says that when he works with rural communities, politics doesn't come up. They just focus on solutions. This show is 36 minutes long and can be played below on this page or via iTunes or via the tool of your choice using this feed. 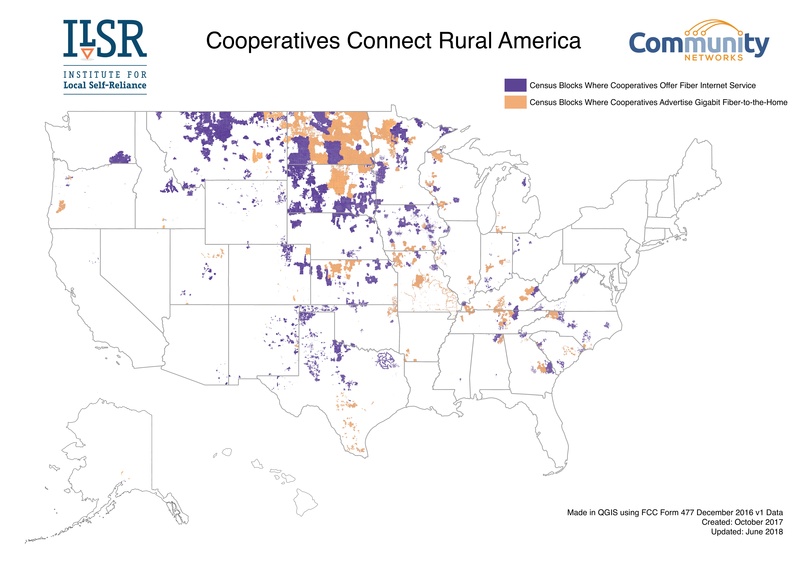 Time to celebrate the work of rural cooperatives that bring high-quality Internet access to residents and businesses forgotten by national corporate providers. October is National Cooperative Month! Let’s celebrate some of the accomplishments of those cooperatives providing next-generation connectivity. We pulled together a list of cooperatives who were actively advertising residential access to a Gigabit (1,000 Mbps) at the end of 2015. These cooperatives rang in 2016 with Gigabit speeds, inspiring others to improve rural connectivity throughout the U.S. In the 1930s, rural communities joined together through electric cooperatives to bring electricity to their homes and businesses. Today, rural electric co-ops may have the power to bring Internet access to these same communities. A recent Broadband Communities Magazine article highlights this potential for rural electric co-ops. In the article, Dr. Robert Yadon and D. Bracken Ross of the Digital Policy Institute at Ball State University explain the results of their recent study. Yadon and Bracken looked into 30 private sector Fiber-to-the-Home (FTTH) providers in Indiana and 16 rural electric co-ops providing Internet service around the nation. After predicting engineering costs, the researchers highlighted a dozen Indiana rural electric co-ops that could serve as regional hubs of connectivity. We don’t necessarily agree with these proposals. Our Christopher Mitchell has written many times about how middle mile cannot solve the last mile problems. The incremental approach based on customer density can repeat some of the same problems we’ve seen with cable and telephone companies - skipping over the most rural and smallest localities. Relying on federal funds is not always necessary. In fact, the researchers point to the success of a co-op that continued on after being denied a federal grant. This 4th of July weekend invites us to celebrate the accomplishments of our country. But, 23 million people in rural areas remain without high-speed Internet access. Rural areas cannot stay unconnected. Agriculture has become a high-tech endeavor, and high-speed Internet access is necessary. Cooperatives, those democratic institutions formed by rural farmers years ago, are becoming an answer. The Missouri Farmer Today recently wrote ofthe sorry state of rural Internet access for one family-owned business in Missouri, the Perry Agricultural Laboratory. They process soil samples and perform other agricultural testing for both local and international customers but the best connections available are via satellite. The lab constantly goes over its data cap and sometimes cannot send their reports to customers across the globe if the weather interferes with their signal. A high-speed cable runs along the edge of the property, but the company would have to pay $40,000 to connect to it. Ozarks Electric Cooperative has a plan to bring fast, affordable, reliable connectivity to northwest Arkansas and northeast Oklahoma. OzarksGo, a wholly owned subsidiary of the electric co-op, will provide Fiber-to-the-Home (FTTH) Internet service with symmetrical speeds of up to a Gigabit (1,000 Megabits) per second. The fiber network will cost $150 million to build over the next six years. ArkansasOnline and local news station KSFM reported on the future network. The residential FTTH service will have no data caps and OzarksGo will offer additional services, such as telephone and video. At the end of the project, all co-op members will have access to the network's services. According to the FCC 2016 Broadband report, 25 percent of all Arkansas residents don't have access to broadband (defined as 25 Megabits per second (Mbps) download and 3 Mbps upload). In Oklahoma, the FCC puts the numbers higher at 27 percent. Rural areas are even higher with 48 percent lacking in Arkansas and 66 percent missing out in Oklahoma. Considering the data collection process depends on self-reporting by ISPs, those numbers are considered low. The number of households that do not have access to federally defined broadband, especially in rural areas, is higher. Soon though, these Arkansas and Oklahoma residents will have access to fast, affordable Internet access. General manager for OzarksGo Randy Klindt, who previously worked on Co-Mo Electric Cooperative's FTTH network, explained in the video below that the price for a Gigabit will be less than $100, which is an entirely opt-in service. Rural electric cooperatives have decades of experience in providing essential services. Now several are looking to improve Internet access in unserved and underserved regions. In central Missouri, Barry Electric Cooperative and Co-Mo Cooperative have already started by providing Fiber-to-the-Home (FTTH) Internet service. Another Missouri electric co-op, Callaway Electric Cooperative, is also getting into the business. The co-op’s subsidiary, Callaway Electric Service, aims to offer FTTH in Callaway County and has teamed up with the local telephone co-op’s subsidiary, Kingdom Technology Solutions. Together, they will operate the partnership as Callabyte Technology. In the fall of 2015, they began a pilot project in a small section of Callaway Electric Cooperative’s service area, which took place in the Stonehaven Subdivision near Fulton, Missouri. Telecompetitor reported that the project had a 50 percent take rate. Each partner brings expertise in specific areas of the project. Callaway Electric Service is building the mainline infrastructure, while Kingdom Technology Solutions will manage customer connections, such as drops to the home and customer equipment. Kingdom Telephone Company, their telephone co-op, has provided FTTH since late 2014 so they have plenty of experience with fiber. This past July the USDA announced over $85 million in funding for rural broadband projects across seven states. The projects, many awarded to rural cooperatives, aim to bridge the digital divide and expand economic opportunities. For those interested in federal funding opportunities, NTIA has just released this guide [pdf]. "Broadband is fundamental to expanding economic opportunity and job creation in rural areas, and it is as vital to rural America's future today as electricity was when USDA began bringing power to rural America 80 years ago. ... Improved connectivity means these communities can offer robust business services, expand access to health care and improve the quality of education in their schools, creating a sustainable and dynamic future those who live and work in rural America." Arctic Slope Telephone Association Cooperative Inc. will connect Point Hope subscribers and prepare for an undersea fiber line with a $1.4 million grant. Garden Valley Telephone, one of the largest coops in Minnesota, will continue to expand its FTTH service area with a $12.63 million loan. On average, the coop serves two households per square mile. Parts of rural central Missouri have some of the fastest Internet service available thanks to fiber service from Co-Mo Electric Cooperative and United Electric Cooperative. The two have worked together to bring gigabit FTTH to cooperative members in central Missouri. Now that they have proven that people and businesses want high capacity connectivity, CenturyLink is about to enter the scene. The company plans to use millions of dollars in Connect America Funds (CAF) to build in areas already served by the cooperatives. CenturyLink argues that Co-Mo and United are not providing voice services because they are working with a third party, Big River Telephone Company, to bring VoIP to members. If this were true, it could disqualify them as providers and lend credence to the argument that there are census blocks in the area that are not served. Because Co-Mo and United install, take phone orders for subscribers, and service phone switches, they should qualify as a provider of land line voice services. CenturyLink also asserted that census block information showed areas unserved even though those areas now have access to fiber connectivity from Co-Mo and United. General Manager of Co-Mo Connect Randy Klindt told us that the timing of their build prevented Co-Mo from providing an active customer in each block, but that service is available to people who live there. Even though it is not a requirement, Co-Mo and United now have detailed information that prove people in those census blocks can, and do, take FTTH service.